Here’s my interpretation for this week’s word. I probably thought of a dentist because I have a “routine” dental appointment tomorrow morning. How could Harry possibly answer when he’s got those darned calipers around his tongue? I’ve gotta admit, this is a routine, I hate and you’re right! Why do they always ask questions when they know you can’t possible answer them! I think it’s sadistic trickery…lol! oh this is eggsellent, can see his pain!!! ugh, i better go too soon. 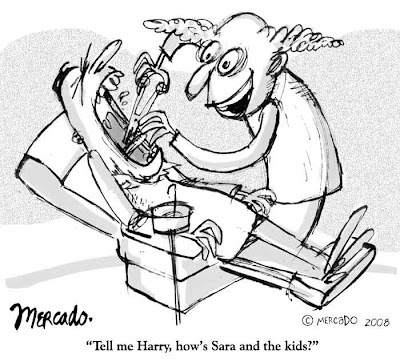 That dentist looks like he is having waayyy too much fun in there! Great drawing of a painful experience! I’d better go check the date of my next ‘routine exam’. Ouch.